The Yellow-eyed Penguin Trust is a New Zealand authority on yellow-eyed penguins and their conservation. We were New Zealand’s first single-species conservation Trust. The Trust has taken the lead in the birds’ recovery through direct intervention and helping others to intervene. Our founding aim was to resource other groups and individuals who were attempting to preserve their penguin populations. We still do this today. But our principal focus is to attend to the biological needs of the penguins. This cannot be achieved without nurturing the natural systems which sustain the birds ashore and at sea. To achieve both objectives, we have raised the penguin to national prominence as an icon species for New Zealand. Our conservation strategy is aligned closely with the Department of Conservation’s recovery plan for hoiho. We are minimizing mortality associated with introduced mammalian predators and recreating high quality breeding habitats, using thousands of plants grown in the Trust’s nursery. We pursue these essential tasks in our own reserves and elsewhere. The work is complemented extensively by education and awareness activities. We work hard to benefit local communities through what we do. The Trust’s projects are more than opportunities to participate in conservation. Restoring local wildlife and natural landscapes is also intended to improve social and economic wellbeing through a heightened sense of identity and place, and local diversified income. Our plant nursery, established in 1988, has propagated more than 140,000 native trees and shrubs sourced from local seed. Most of these have been planted out in the appropriate habitat to provide more shelter and better nesting sites required by the penguins. This penguin has become a national icon, for example appearing on the five dollar note, and now contributes significantly to the experiences of international and domestic visitors engaged in wildlife viewing. Through a joint effort between the Yellow-eyed Penguin Trust, Department of Conservation, private land owners, scientists and individuals, the yellow-eyed penguin population has increased from the lows of the early 1980s but the population is still a long way from being self-sustaining. 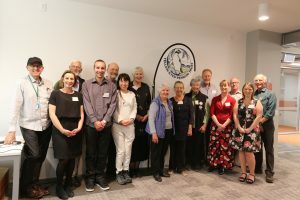 We are recognised as a Key Programme Partner on hoiho conservation with Te Rūnanga o Ngāi Tahu and the Department of Conservation. This means we are ideally situated to undertake our conservation programme. The Yellow-eyed Penguin Trust looks forward to the day when we and other penguin conservationists have made ourselves redundant.